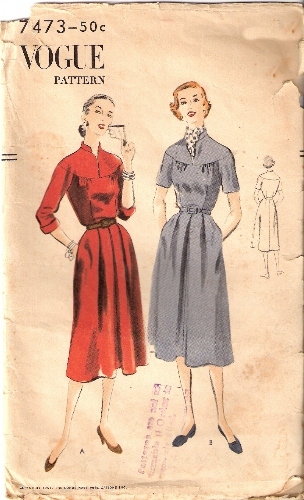 Perhaps these vintage pattern-picture gals are looking to the future with hope and optimism … could they have known that Erin will make a fab dress in which to watch the Inaugural festivities, perhaps? I don’t want to wander too far off the topic of dresses, so I’ll just say, “hooray!” and I wore Bon Voyage for the occasion today. “So long, farewell,” etc. etc. Wow, tea — that dress! I’m speechless! It’s wonderful! The buttons alone are genius! Perhaps the bi-partisan color combo is giving you hope, too! =D I love this and I probably would have bought it, too. YUM. Erin, so glad you didn’t choose the 50’s dress with the strange neckline! Reminds me of the end of a cake decorating tool – you know, the ones you use to pipe frosting. Very strange! That second dress doesn’t have pockets, so I think you made the right choice.Were you in Grant Park last night? I’m not sure I could’ve resisted, if I were just a little bit closer to Chicago. Great dress, and I agree about the scarf thing. Kind of like some folks have the hat gene. Do you know how sad I was when I looked at the one you passed over and saw it was gone? Tea: incredible dress – is the fabric a current one? It is definitely part dress time! I love both dresses, but the first one is better. The second one looks very 1950’s futuristic in kind of a strange way. Maybe as the person above said – in a dirigible hostess way. I also have a weakness for gathered shoulders, perhaps that weakness is genetic and cancels out the scarf gene.But today I don’t care that I am not good at scarves. I am very cheerful, even though I had 4 hours a sleep. Optimism will get me through the day. I too love 3/4 length sleeves. They are my favorite: cool enough for summer, and still warm for winter. And hooray for change! I think you made the right pick. I don’t like the scarf with the collar. If it didn’t have a collar, I think a scarf would go great with it. Maybe you need a training scarf? You could start out with something less obtrusive and work your way up. You know, the little ‘pretend you are until you become’ trick. It’s a beautiful dress, and a beautiful day. It truly is.My hubby and I are considering making the trip from here in Canada to the inaguration…and I definitely need to find the perfect dress. It will definitely have that neckline, it’s stunning. Thanks, Erin! And fabricgirl: I think they’re both out of print but only recently so. Bon Voyage is by Makower. If you do a search, you might be able to find yardage of it. I got mine from 5bucksayard.com, but they’re out of this one.I can’t remember who did the map fabric, and I just did a fruitless search. Sorry! PS: what is the woman on the left caressing her face with? It looks like a small-ish butcher knife. except that Calif. prop. vote–whats up with that? It’s a bummer Proposition 8 passed (most of its funding was provided by the Mormon Church…itself not historically renowned for “traditional” marriage) (ie, polygamy) HOWEVER the whole issue will move on the the U.S. Supreme Court at some point, following the path of how state bans on interracial marriage were eventually overturned. I think Gloria Allred is filing a lawsuit to help “The Cause” today. Here’s a pic of me without makeup, just in case someone in Massachusetts or Connecticut wants to marry me. Would accept a serger in lieu of a ring. PASS IT ON! PS: I am not missing a tooth, as that pic sort of makes it appear…. Cookie, you are gorgeous, if I may so myself. Oh brother, that should obviously read, “if I may say so myself.” I’m bleary-eyed with exhaustion and elation. Doesn’t look like the gal on the pattern cover is pulling off the ascot either. So don’t worry. Personally, I always liked that this blog was non-political. There are plenty of places on the web to talk about the election but only one site for airship hostess dresses and fauxleros. Cookie, I think you look great either way….maybe some dashing pransome hince will see your pics and fidn you here…Then we can all make fabu dresses to attend you wedding! Cookie, I think you look great either way….maybe some dashing pransome hince will see your pics and fidn you here…Then we can all make fabu dresses to attend you wedding! Thanks, Theresa! It would be nice if he had a pair of little girls I could sew for, too! I watched over a friend’s household of 3 boys one month while she was traveling, and I must say it was very fun (and serene) getting them ready for school, loading the washer, sorting toys, shopping for dinner, doing some writing in the afternoon and then seeing them all at the dinner table. Bedtime, alas, was another story…but all in all I LIKED IT! It also gave me a new appreciation for my mom, as doing that alone on top of a full-time job would have turned the whole thing into a trip to HELL, and quadrupled the vodka expenses. Thanks for your comment anonymous, but where on the web can I find something that links air hostess dresses with the election?! It was just my vague wistful desire to see the two connected in some way and who better than Erin I thought! Ha. I have that second pattern in my stack. You never know when you need a cool pattern for a S.-F. themed party. More seriously, I don’t know if I will ever sew it, but I needed to have it for that cover picture. My grandmother has the scarf gene… but then she is a tall, thin retired English teacher. Who owns her own grand piano. I LOVE THE IDEA OF REVERSE SUMPTUARY LAWS!But of course we must calculate by value of materials and workmanship (with special points for fashion “effect”), not for what you paid for it. And it should be a monthly tally, so you can save up a few “down days” to paint the kitchen. I have a 16 year old daughter who woudl (a) absolutely worship you (b) is “dying” to move to California. Next year she starts her junior year and is hoping to get accepting into her high school’s cosmetology program. She woudl then graduate with her SC Cosmetology liscense (providing she pass the exam. Let me know when you want me to stick a stamp on her forehead and let you borrow her.